Incredibly easy to use, this complete black box spy camera system will record HD video and audio whenever motion is detected. It can be placed anywhere and looks completely at home on a bookshelf or hidden beneath something on a desk or table. Insert a micro SD card (up to 64G supported – not supplied) and switch the camera on. That’s it! It will now record video and audio whenever movement occurs in front of the lens. You can adjust the motion sensitivity setting and also choose how long the black box camera records for when it is triggered: 1, 3, 5 or 10 minutes. The audio recording can be switched on & off and the device will also allow you to have the time/date watermarked on all of the recorded footage. Video is recorded at 1920×1080 resolution and at a maximum of 30fps. Video files are .MOV format. The fantastic 5000mA rechargeable battery (built in) offers standby time of up to 6 months, so dependent upon how busy your subject area is this covert camera system can offer excellent running time before needing a recharge. How long the battery will last depends upon how often it’s being triggered, how long you set it to record for at each trigger and whether it is doing a lot of night vision work (the infrared draws much more power than is needed for just daytime recording). The built in covert infrared is invisible to the human eye and gives a night vision range of up to 5m. The infrared will switch on automatically when the light level is low, nothing at all for the user to do! This black box spy camera system is completely without cables, it’s small and light so offers great portability. How big is the black box? The dimensions are 11.5 x 6.5 x 3 cm. 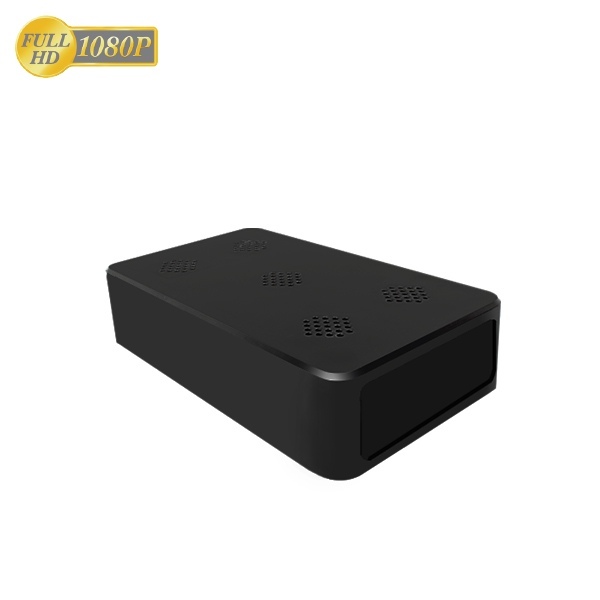 This model does not have WiFi functionality but if you would like to be able to see live footage from the camera on your mobile phone or tablet please take a look at our WiFi Black Box Camera here – same camera but with the option to view live footage from anywhere in the world and control the camera from the free app! The black box camera system supports up to 64G. Always use SDHC, class 10 micro SD cards. Make sure you are using an SDHC, class 10 micro SD card and format the card in your PC before using with the Black Box Camera. Insert the card into your camera and switch the camera on. The camera system will now create a text file on the card. You can now remove the card from the camera and connect it to your PC using a card reader or you can leave the card inside the camera and connect the whole device to your PC using the USB cable supplied. Once you have connected the card to your PC, look for the Time file and open it. You will see the various menu options (as detailed below). To change any of them just change the number to the right of the = sign. Once you have finished making any changes just save the file and insert the card back into the black box camera. MOTION_TIME=1;(0=1min,1=3min,2=5min,3=10min) – n/a for this product. TIME_SET=N2017/01/01 00:00:00;(Y=change N=No change) – year/month/day format.